It is a well-fact that this will be one of the first questions you will face in any interview and the way you answer it will set the tone for the entire interview. One thing that stays true for this answer every time you are asked. 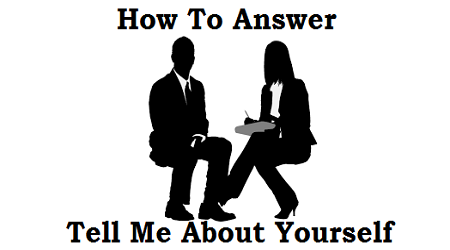 So, here are tips on how to answer tell me about yourself question. Employers are not asking you this question because they want to know what your favorite color is, they want to know why you are the best candidate for the job. Employers want to hire the best person for the job and your job is to convince them that this is you. As it is most likely the first question you will face in your interview it is one of the first impressions you will be giving to the employer. You want to give the most professional image of yourself as possible. In order to accomplish this, do not volunteer personal information. Supposed your answer is: Well I am 23 years old and I was born and raised in this city. I have 4 dogs and I love playing football. By analyzing your answer, you have already yourself back. You should not give any information about your personal life, rather your professional life, like how it relates to the position for which you are interviewing. To do this successfully you need to prepare structure your answer, highlight your relevant education, experience, and professional qualities. From the advertisement, you will probably know about the job description and the qualification required and what are the skills and experiences the employer is looking for. So, you have to highlight all of your previous work experience, education, training and all other professional skills that are relevant to the position. No matter what your work history is you have transferable skills. If this is your first job in your field then highlight the skills and training you receive from your education as they pertain to the job and talk about any transferable skills you might have gained from any of your work experience. Highlight your accomplishments as well. If you have received any academic awards or any promotions or any commendations from your job, feel free to mention it. Not every position you interview for is going to be exactly the same. Even if the job title is. Each company has different needs. So, study the job description and figure out exactly like, what it is they are looking for. Once you figure out what the employer is looking for in a candidate your job is to be that person, so emphasize the skills and qualifications you have that are related to the job specifically. Try to keep your answers in a chronological order. You do not have to recap your professional history year by year. But detailing the experiences and skills that you have gained or as you have obtained them and organizing them will leave a good impression on the employer. Your resume can help you with this as it is chronological order and can help you set a timeline. Now that you have the structure, here is a good example of giving an interview on a medical assistant job for “tell me about yourself” question. I believe I have a very solid background in medical assisting. I earned a degree in medical assisting which I learned viable skills such as taking vitals administrating injection explaining treatment procedures to patients, preparing patients for examination and assisting the physician with the examination. While earning my degree I worked in customer service at ABC pharmacy for three years as well, where I gained valuable communication skills and learned how to address customer’s needs which enabled me to relate and effectively communicate with patients and their need.I also completed the internship at a health clinic. While in school where I picked up more valuable skills including updating patient files and medical records handling correspondence scheduling appointments arranging for hospital admission and help make sure the office ran smoothly. These are all valuable skills which I will hopefully be to apply for this position and bring to your office. Remember when answering the questions, “tell me about yourself”. Always keep it professional and do not give any personal information, highlight your skills from your relevant education and training that will help you in the position. Tell them about your work history and transferable skills as it relates to the job you are interviewing for and always do so in an organized chronological fashion. These are some amazing tips.